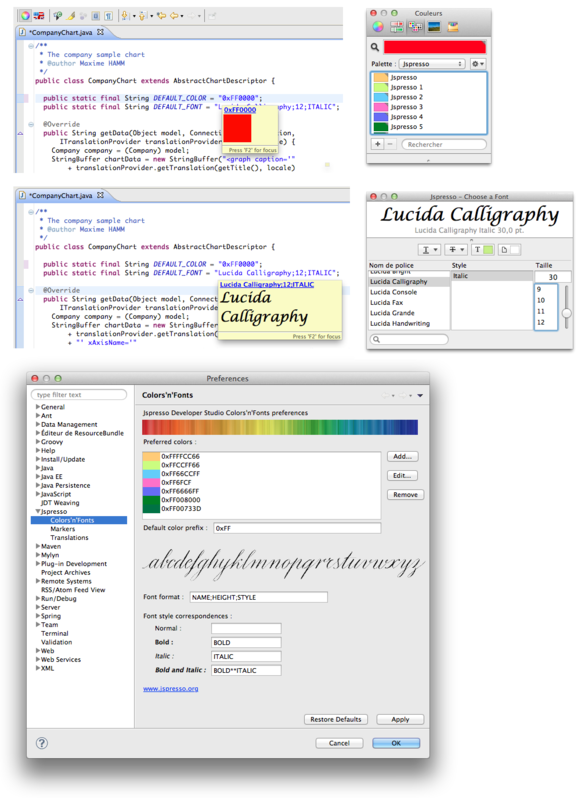 Jspresso Developer Studio Colors 'n Fonts helps you to edit Colors and Fonts simply from within your java editor ! Supports also tooltip : fly over your string literal to display the current color or font... and activate hyperlink to open the editor popup ! Save your preferred colors to select them faster than ever ! setup your prefered colors from eclipse preferences (new Juno feature). By adding the following code below to your website you will be able to add an install button for Jspresso Colors 'n Fonts. The link to the plugin seems to no longer exist, nor does the link to the plugin support page. Oh well, it was nice while it lasted. I think this is the plugin that a buddy of mine is looking for his personal project.